A few days back, my friend Monika asked what my weekend plans were and if I wanted to go to Anykščiai, a village of about 12,000 people in the north midwest area of the country. Now, for those playing at home, Monika is a great friend and in the past we’ve done some great road trips like to Tallin and Finland, just to ride the roller coasters (of course, that trip was before I was blogging so no good record of it exists outside of incriminating photographs). Now, though, Monika has a car so there’s a whole new world open to us. Add in the fact that LAST year for my birthday, she gave me a stuffed creature and a book of 100 sites to see in Lithuania in which I had to take pictures of the creature and I was falling behind due to my lack of independent transport. What she was offering as a fun day trip, with one of my best friends, to take pictures and see things I hadn’t seen yet. Naturally, I said “Yes!” and we planned to meet up 9am on Sunday. Our first stop, apart from coffee and water, was in a small village where Monika had been as a child (okay, to be fair, all of the places we were going were places she had been when she was around 9 or so so it was a memory lane trip in certain respects). There was a HUGE church, much too big for the size of the community and beyond it a special spring of water. Of course, being an old European country, there were no signs or explanations, just a cool clamshell backdrop and a pipe guiding the water down into a reservoir. So while we know it’s a magic spring, we have no idea what that magic is – being a writer, of course, I’m gonna come up with something, I assure you! From there, we actually made it into Anykščiai proper. We hit the Tour Information office, got a guidebook then went to explore the literary legacies. Just behind the Tour office was the home (now museum) of Antanas Vienuolis, probably one of the most famous Lithuanian writers. Since Monika is a tour guide herself (and there was no one else there) we got the grand tour, including the upstairs of his house where everything is preserved just as it was when he died in 1957. He’s buried in the yard in a small grave. On the other side of the house is a building with a small cabin built inside. 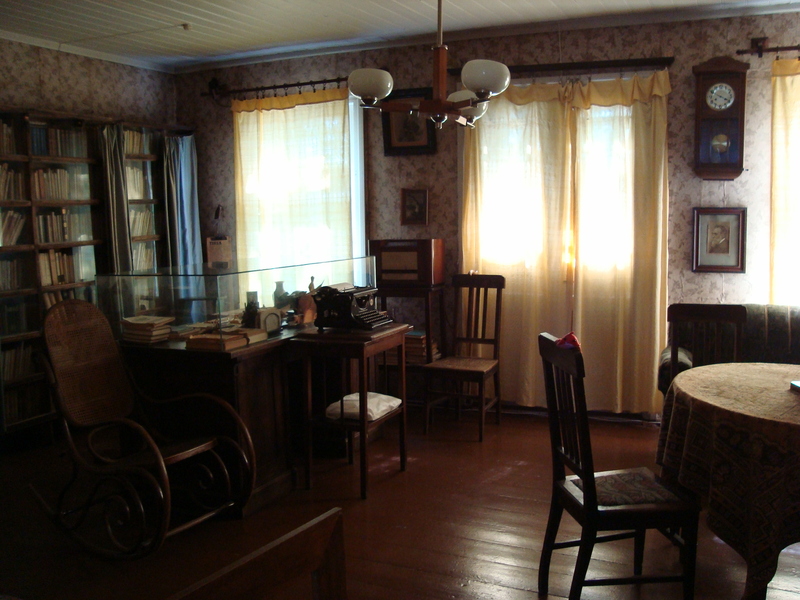 The cabin, the home of another famous Lithuanian poet, Antanas Baranauskas was moved there, log by log, to preserve it. Why was it moved there, though, in the yard of Vienuolis? Because Baranauskas was Vienuolis’ great uncle. The Lithuanian Literary greats all stuck together. In fact, a little later in the afternoon, we would visit the forest tomb of Jonas Biliūnas, a boyhood friend of Vienuolis. Another nearby museum, included in the tour of the house, features the work of Stanislovas Petraška who used stone dust to create amazingly textured and detailed scenic paintings. From there, we were going to walk up the road to check out the narrow gauge railroad (now, all rails in Lithuania are narrower than our surrounding countries but this is especially narrow). We’d already missed the scenic train ride and to be honest,it was just too hot. 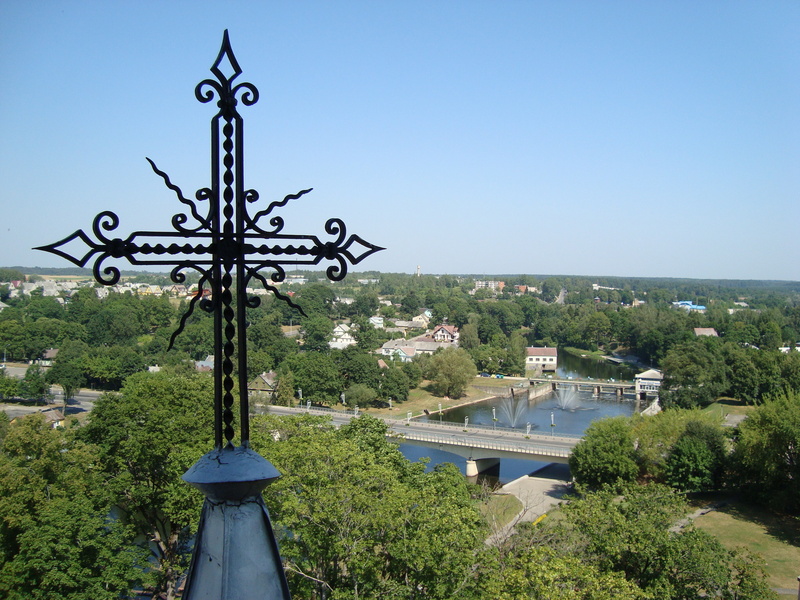 We got about halfway, decided against walking and went back to the car and drove up to catch a glimpse of the station then headed for another parking spot to walk the river bank and climb the church tower of the tallest church in the country. On the way back to the car, we were going to stop in at the Angel Museum, figuring that since Kaunas had the world’s only Devil Museum it was only fair play to see the angels. Walking in the building though, it smelled bad and the exhibits looked pretty lame. 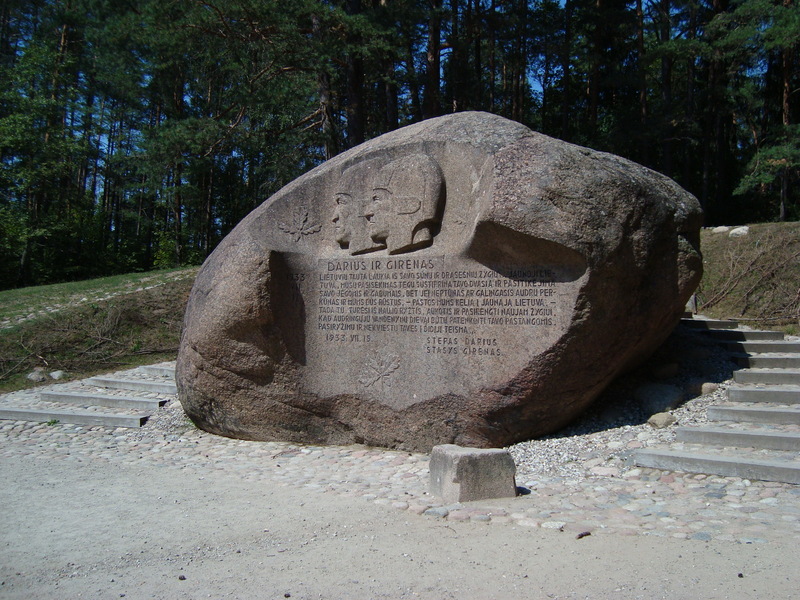 We passed and headed out of town to see the Puntukas Stone. some point in the distant past. But the thing that makes it cool, aside from the 1943 carvings of faces of pilots Steponas Darius and Stasys Girėnas, are the legends which surround it. My favorite is that the devil wanted to use the stone to block or crush the Anykščiai church but was running a bit late. A rooster crowed as the sun came up, and we all know the devil can’t be around after sunrise, so he vanished back to hell, leaving the huge stone to plummet to the Earth, where it remains to this day. Anykščiai is like a hub of a number of cool places so we were constantly driving in and out of town – nothing was really that far – so we headed back from Puntukas (stopping at the corn maze which looked pretty neat but was expensive and walking aimlessly is not something you want to do in 35 degree heat) and went to see the aforementioned grave site of J. Biliūnas. 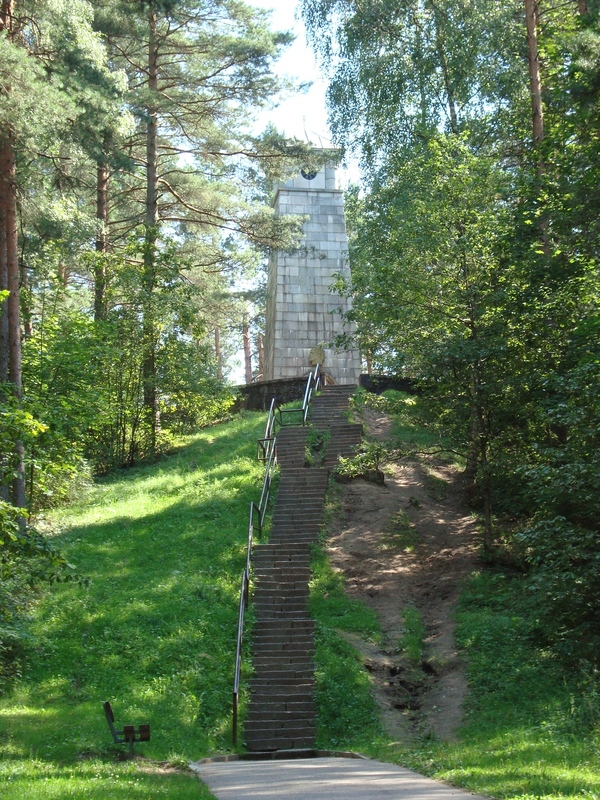 Biliūnas, for some reason, decided that his final resting place should be in the middle of the forest, on a large hill, with 87 (yes, we counted) steps to get up to it. 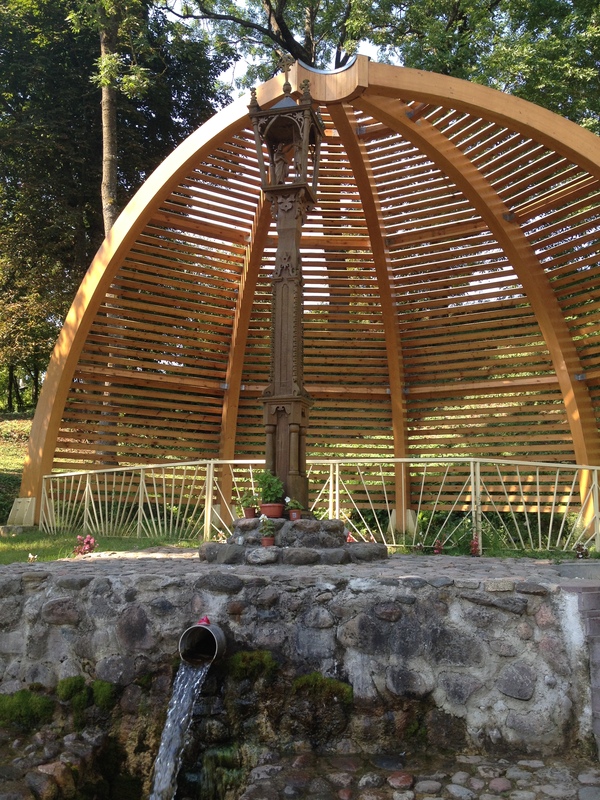 It’s a tall monument (14 meters) known as the “Light of Happiness” with the actual grave in the base. Being in the middle of the forest, though, there wasn’t much of a view. We decided a view was needed, though, so we went in search of an observation tower. A few years ago, the Lithuanian equivalent of the BLM decided to build these observation towers all over the country. They’re maybe 70 feet high or so, made from metal grid so not very elaborate or expensive, but they offer amazing views of the surrounding landscape. I’d been on one once before (with Monika, natch) when we went to Rumšiškės for the day. This one overlooked one of the many lakes in the area (Lithuania is known for an amazing lake district). It was beautiful. Of course, we got lost trying to find the thing but that’s what adventures are for, right? By this point, lunch was getting to be a necessity so we decided to try a place we’d seen earlier, a little kavine (bar/coffee place with a small kitchen) on the river. See, I’d asked Monika what she wanted for lunch and she said “food.” Ironically, “food” is what we got. We both ordered chicken dishes and neither was cooked all the way through, mine was so heavy on the spices you couldn’t have tasted anything else and the dining area itself was a bit of a ramshackle. “Food” was the best we could say about what we were served. 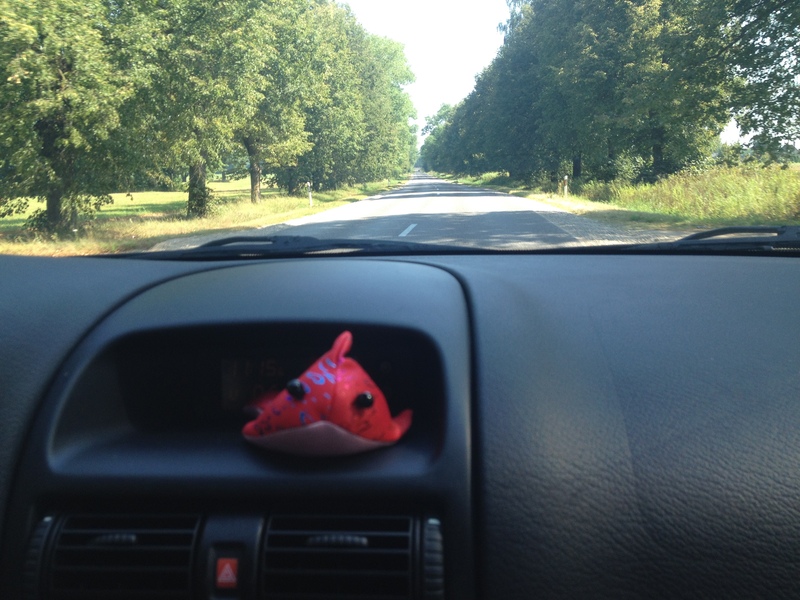 When we were leaving, Monika asked if I was going to blog about it. When I said yes, she asked why? That she would just as soon forget a bad meal. I told her because it’s how I remember these adventures and for me, the simple idea of knowing she should have been much more specific on what she wanted for lunch, and the fabulous laugh we had over it, was worthy of a mention. view of the countryside. But what was even better was that in the courtyard they had a bow and arrow practice target so I got to fire off a few shots. I sucked and the bow was crap but I certainly felt like I was going after those who had “failed this city!” There’s a local archery place which, as soon as the semester starts and I get a little settled, I’m going to sign up for lessons. There’s something incredibly zen about a bow and arrow. A stop at the horse museum was next on our itinerary, where again, we just walked around without actually going into the museum. We got the flavor of it for sure (and the ice cream we bought while we were there) then it was back to town and the last stop on our day’s adventure: Kalitos Kalnas Alpine track. 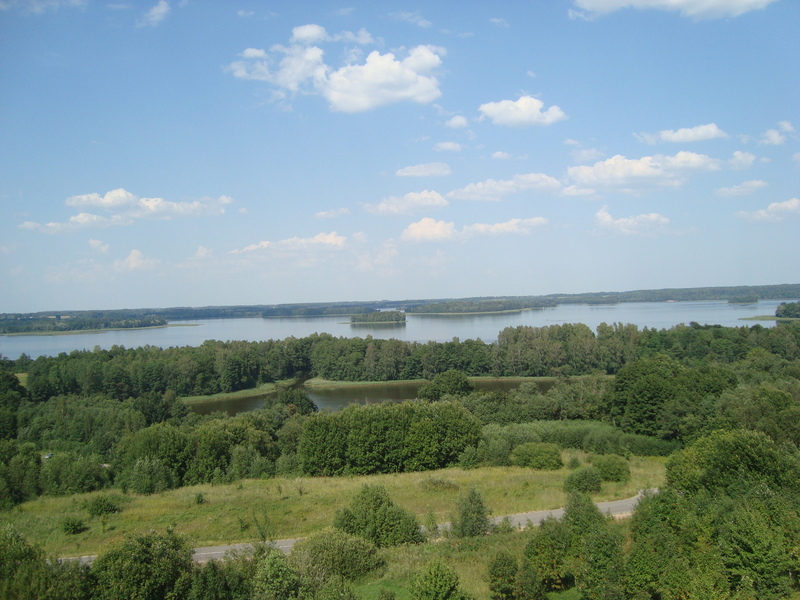 Lithuania is not known for its mountains. Truth be told, it’s one of the flattest countries in Europe so any type of decent hill is an excuse for a ski slope. Here in Anykščiai they make use of the hill for wintertime fun. Needing something to do in the summertime as well (no matter how short it may be) they built a half kilometer long “bobsled” track (which is actually open all year long). 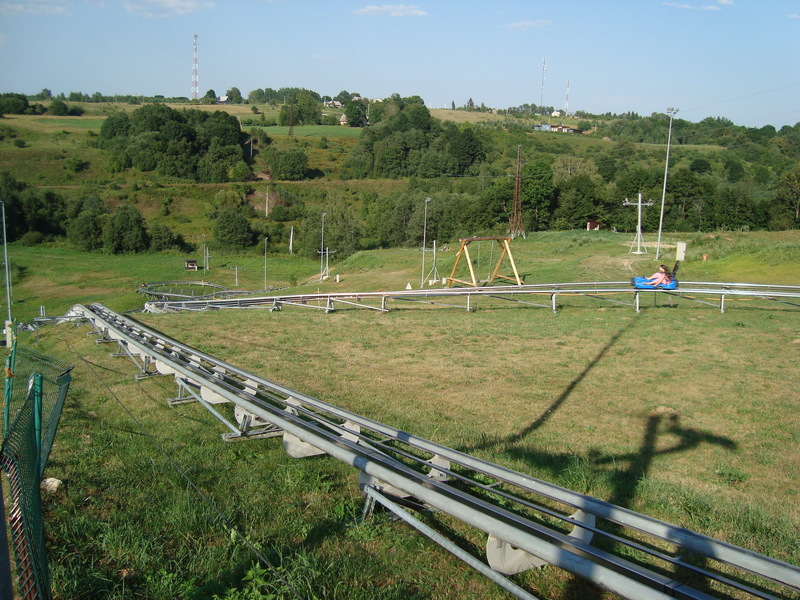 It’s a 40 mph ride down the slope where you control the brakes. It’s awesome! Not exactly a roller coaster, but still a lot of fun. We each went down 5 times (which was enough) and got out of there just before the really drunk folks took over the toboggans. Monika successfully completes the circuit! All in all, Anykščiai proved to be a perfect day for a getaway. There will be more adventures soon, and I can’t wait! Nice track. it looks like the tracks (tubes) are welded, so it should be a smooth rolling surface. Was that the case? 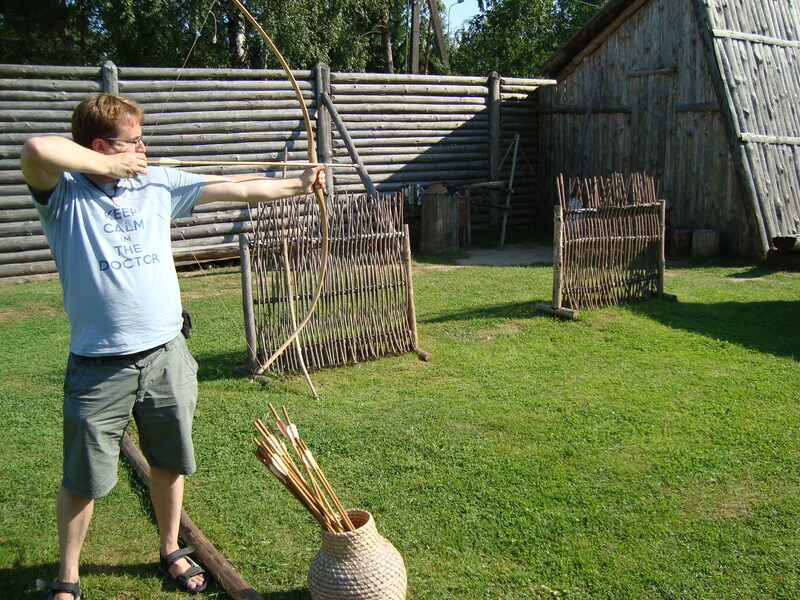 Good archery form, though you should have used a finger tab, drawn the bow further back, and the arrow was on the wrong side of the bow. I like the stone, but also the fact that the wiki page for Darius spends as much time talking about him being the father of basketball in Lithuania as it does his final flight. In september I’m gonna start archery classes so I’ll get better! And really, the arrow should be on the inside? I have failed this tourist attraction! Because you held the string in the right hand, the string rolls off the fingers and moves to the left a bit, kicking the trailing end of the arrow to the left. This is compensated for (sort of) when the arrow rests on the left side of the bow (see Archers paradox). Having the arrow rest on the right side should have put your arrow trajectory to far to one side of the target.